We’ve heard a great deal about the Internet of Things (IoT) and how it’s going to change the face of business as we know it. However, the Industrial Internet of Things (IIoT) goes a step further, particularly with reference to how smart sensors and actuators can enhance and improve the manufacturing and industrial processes. So, what exactly is the IIoT and how will it really change every business? Read on to find out more. To put it simply, the IIoT aims to dramatically improve efficiency and productivity within the industrial industry. It leverages the power of smart machines and sensors to take advantage of the data that machines have produced in industrial settings since they began. The combination of real-time analytics and smart machines is not only better than humans at capturing data, but it’s also more accurate in reporting the information. IIoT vs IoT – What’s the Difference? IIoT and IoT undoubtedly have plenty in common, from cloud platforms, sensors and connectivity to machine communication and analytics. However, there are a few differentiating factors. For example, IoT applications connect devices across multiple fields – between healthcare, agriculture and enterprise for instance. IIoT, on the other hand, only connects machines and devices within specific industries such as oil, gas and manufacturing. Though the technology has received inordinate amounts of funding, technical due diligence is still frequently required from some sceptics. On the whole, however, there are many positives that investors simply cannot ignore. One of the main benefits is the aforementioned predictive maintenance. This will almost allow industrial businesses to operate like clock-work. It will predict faults in machinery before they actually happen, allowing for swift work in fixing any issues. This prevents losing any time from production due to a defective machine which may have previously cost the business money. A further benefit is asset tracking. Now, suppliers, manufacturers and even customers can use asset management systems to monitor the location and status of products throughout their life cycle. This will include everything from manufacturing to dispatch. It can send alerts to various stakeholders if it’s thought that the product might be damaged, allowing them to take preventative action before it’s too late. Interestingly, the top three industries investing in IIoT are transportation, manufacturing and utilities. Where some businesses may be reluctant to adopt new technology, it seems that the IIoT is different. It’s an exciting prospect, which continues to accumulate more appeal across the globe as it develops. Time will tell just how quickly this technology will change the way many industries operate. In around 30 years, planet Earth will be home to almost ten billion people, 68 per cent of which will live in urban areas. And those urban areas will face a torrent of problems, as authorities will have to rely on limited resources to provide public services to a growing number of citizens. Besides traffic congestion and the potential rise in crime rates, rapid urbanization could also lead to a number of environmental problems like air pollution and overwhelmed waste collection systems. 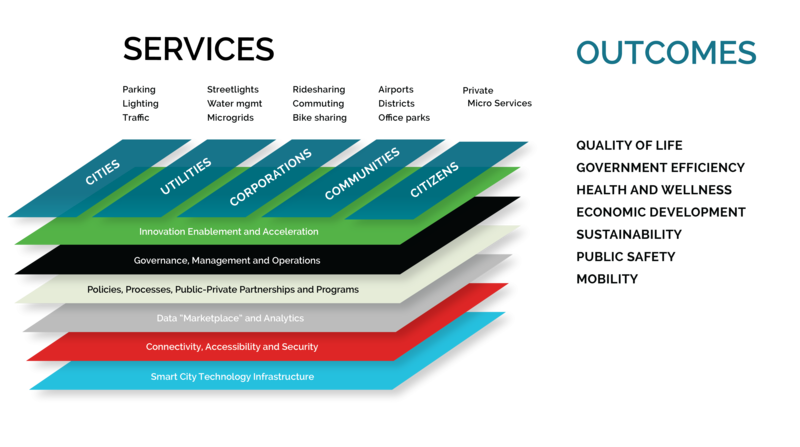 To tackle these challenges and make cities more liveable and manageable, governments are increasingly turning to the smart city concept. Investments in smart cities are ramping up across the world and are expected to grow from $80 billion this year to $135 billion by 2021. Part of that money is allocated for IoT projects that help governments and residents to increase energy efficiency, improve traffic flow, reduce pollution, cut costs, and enjoy a number of other benefits. In other words, the IoT helps smart cities to achieve many of their key goals. Take, for example, the problem of traffic congestion in cities, which is in large part caused by drivers looking for parking space. IoT sensors embedded into the city’s streets, as in the case of Barcelona, can detect empty parking spots and alert drivers through a smartphone app. This helps people park their cars faster, saving time and fuel while reducing harmful emissions. Many smart cities also tend to promote bike-sharing services as a way to reduce pollution and congestion, but bike theft could be an obstacle for that plan. One way IoT tech can help solve this issue is through technology such as Bitlock, a keyless bike lock that’s unlocked by the user’s smartphone and tracks the GPS location of the bike. This will help police potentially track and recover stolen bikes, while also allowing private and public organizations to analyze bike traffic patterns and find ways to improve the service. IoT technology is also efficient in tracking and analyzing water use in buildings. For instance, Banyan Water, a smart water management company, claims it’s helped customers to save more than seven billion liters of water since its inception in 2011. The way it does this is by placing sensors and ultrasonic meters that track water consumption across the building, using software to analyze the gathered data and find anomalies such as leaks and overspend. Clearly, IoT technology can improve lives in urban areas in many different ways, but simply implementing the latest tech won’t necessarily make a city ‘smart’. Marc Jadoul, the head of IoT market development at Nokia, explains that even before the first sensor is installed, the authorities must define their future objectives and budget. The next step is to create broadband internet and IoT infrastructure that can sustain increased traffic. Jadoul also suggests that the authorities need to “think big, but start small” and “identify appropriate milestones and metrics” to be able to monitor their progress. Lastly, technology isn’t the goal, but rather an instrument to make people’s lives better and more connected. To that end, the authorities should promote citizens’ engagement in ‘smart’ projects by asking for their feedback and informing them of the progress. After all, “it’s citizens’ acceptance and engagement that will eventually determine success or failure of any smart city initiative,” Jadoul concludes. As our planet becomes increasingly crowded and more people flood to cities, authorities will be under pressure to provide public services to an ever-growing number of citizens and offset the negative consequences of urbanization. Technology such as the IoT and the concept of smart cities might be a solution and a way to fight traffic congestion, pollution, inadequate water systems, and a number of other problems. But for this approach to succeed, citizen acceptance and engagement is crucial, as simply rolling out the tech won’t be enough. Glaeser, Edward and Helen Dempster, https://www.theigc.org/reader/contagion-crime-and-congestion-overcoming-the-downsides-of-density/cities-and-urbanisation-encourage-economic-growth-in-the-developing-world/. The benefits of using Edge Computing / Machine Learning solutions are very attractive to manufacturers because allows minimize latency, conserve network bandwidth, operate reliably with quick decisions, collect and secure a wide range of data, and move data to the best place for processing with better analysis and insights of local data. Internet of Things industry is developing rapidly and it provides people with a range of digital devices and sensors all around the world. According to predictions of Gartner consulting agency, about 6,5 billion of connected 'things' will be available by the end of 2018. And, by the way, this figure has grown to 30% comparing to 2016. It is expected that we will get almost 20 billion IoT devices by 2020. As IoT is surrounding us in all fields of activity, banking area is also striving to make use of IoT and get some benefits. 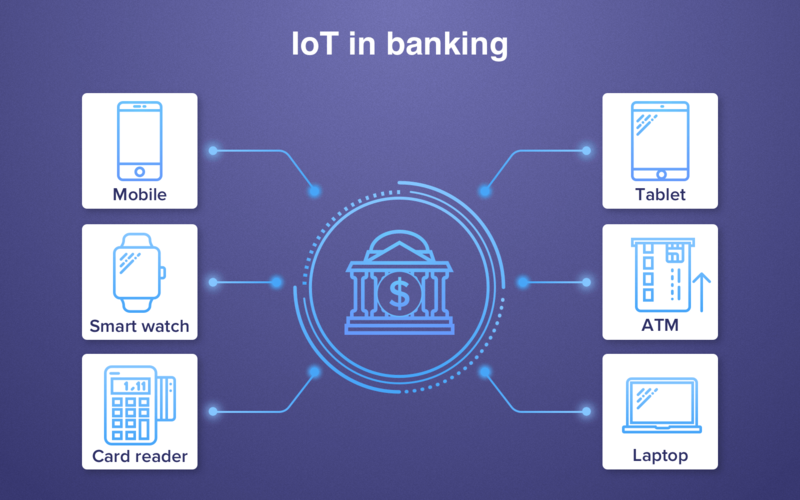 The niche of IoT software development is growing, so let's see the main reasons why you need IoT in banking and other financial services. Usually, when you start dealing with something new, you need to see strong reasons why you need it. That is why before you start developing your own the IoT solution for banking or any other FinTech service, you need to see advantages of IoT in this field. How has the Internet of Things impacted business? In this section, we will pay attention to 5 benefits why IoT can be beneficial for financial business. For example, when individuals want to insure the car or house, using the IoT, they can always get access to the up-to-date information regarding patterns of using the insured product. If they insured the car, they can see all regulations and rules concerning all insurance cases gathering sensor data from any point - whether it be their home or car. And, yes, it is just one example of thousand other possible options thatIoT solution providers can offer. Considering that preferences of the customer change very fast, financial institutions along with other fields simply cannot ignore new digital innovations and they need to engage in the development of new solutions. Today customers can always stay in touch with their bank using a tablet, smartphone or laptop. That is why banks see perspectives in the development of IoT apps that make it possible to gather more data about customers, their behavior, and preferences. The IoT connections facilitate a widescale data collection about users. This data helps banks understand their customer better and offer them more interesting and personalized experience, useful target tips. It leads to a new level of interaction between bank and customer and to the great future of banking technology. Example: imagine that your customer came to your bank and they just enter the main door. You can use the network of sensors and beacons with appropriate software to authenticate the customer with the biometrics like facial recognition. This customer every day withdraws a certain amount of money in ATM of your bank, and thus ATM will prepare money for the customer, and when the user enters his PIN, cash will be prepared to withdraw. By the way, you can find more benefits of facial recognition software in our article. As you see, IoT and banking area can be mutually beneficial. If the bank learns more information about their customers getting the data from the IoT devices, it helps improve decision-making process with better customer service and product strategy. For example, using data from social media or buying preferences of the customer, banks can build the picture of potential credit risk for each customer and then make commercial offers to the potential customer. Here you need the development of analytical software that will help implement it, and our company can assist in it. Thus, IoT in financial services can help specialists understand the general condition of other fields. Up-to-date data will give the current situation in retail or agriculture that is very important in the process of new markets analysis. Combination of sensors and software will help make cashless payments automatically, without even touching user's phone or banking card. This financial solution can become widespread one day. As an example, users go to the cash register in the supermarket, and there is a sensor installed that detect the number of products in their cart and the type of these products. Then it calculates the total sum for all products and connects to their mobile wallet. The payment is done automatically. But of course, this FinTech solution should undergo governmental approval to meet all financial regulations. For today, capabilities of the IoT in banking sector and other financial areas are not revealed in a full manner. The Internet of Things is just starting entering in FinTech. But it is expected that the IoT will play a very important role in banking strategies. Experts predict also the development of the niche where customers will be able to connect their banking account to the range of smart devices. For example, smartwatches will give their owners a signal when they exceed the limit of planned expenses. Today banking apps already can give you notifications about all financial transactions, but this algorithm will be modified to the new level. 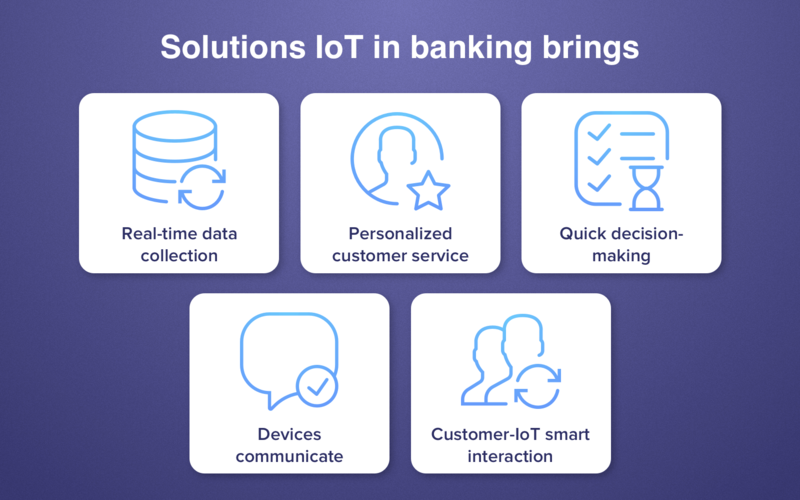 As a result, we can show a simple example of what capabilities IoT in banking and finance area has, but this list will grow as innovations appear. And if you have any idea on the development of your own banking software - do not hesitate to contact us. Banks from all over the world are trying to use IoT capabilities in their industry to get more customers involved. Starting from mobile banking apps that today are used by the majority of all world banks, since apps help monitor preferences of customers, to the range of sensors that make it possible for financial institutions to gather information from their branches and sensors in wearables that can track how customers use banking products. The Internet of Things and financial services create a beneficial combination. If you are a faithful fan of our blog, then you saw our article concerning the prevention of fraud in FinTech app using artificial intelligence. Well, IoT and AI can become the symbiosis can enhance and improve the process of fighting the cybercrime. 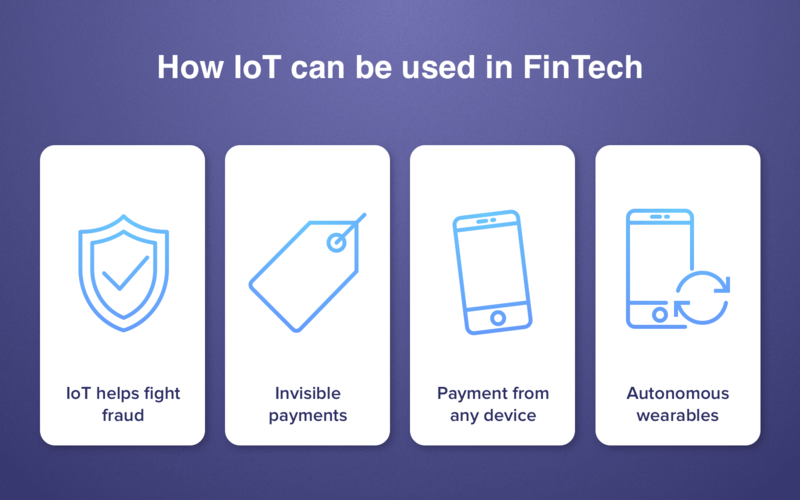 IoT FinTech devices and software with integrated AI can collect more data about financial transactions made by their customers that will help improve the security level and make financial processes easier and more secure. As we mentioned above, the combination of sensors and software facilitates the development of invisible payments and other main financial procedures using wearables like smartwatches, voice-recognition devices, special RFID sensors in Uber cars and restaurants to make automated payment without taking the phone out. A 22% of world financial organization CEOs predict the payment from cars to become a reality in the next two years, according to PwC. Let's not forget about smart refrigerators and other home appliances that also allow users to make payments for food delivery, like an example. IoT in finance industry can let you create an ecosystem for the optimization and acceleration of payment process. Pay from everywhere - wherever you are. Cleveroad can give you a hint on how to create an advantageous IoT app. As for statistics, 60% of world-leading financial institutions plan to make wearables the main payment device within a couple of years, it is a kind of IoT business strategy. Moreover, it is highly possible that the new generation of wearables will be created - wearables that function without a smartphone. Rings, VR devices, and even hi-tech clothes will replace common smartwatches one day. Never forget about the main rule - all coins have two sides. And IoT technology has its second side that will show you some pitfalls IoT brings to humanity. Especially if it concerns finances where accuracy and security are highly important. All benefits shown above will bring some problems related to confidentiality and security of customers' personal data. The financial field that uses IoT connections should make sure the safety of personal data to their customers. Let's see main weak sides of IoT in FinTech. That is the main danger that can be ahead when people use the Internet of Things in finance. Since IoT is the whole network of devices and various software, the risk of hacking is increasing exponentially. And in case of financial industry, the privacy and security are the most important issues to be taken into account when thinking about protection. When the financial and personal information is being transmitted through the IoT network, all this data can be breached and hacked. So the privacy and security concern means a lot and rapt attention should be paid to it. Different devices require different maintenance approach. Unfortunately, there are no common standards for maintaining IoT equipment. It seems to be impossible for today to resolve this issue. The matter is that all hardware used in IoT can be manufactured by different suppliers and they cannot have one common maintenance standard. And even if all hardware manufacturers in the world will agree to use one specific standard, technical issues will still remain. Only if there will be one monopolistic manufacturer of all equipment, but it is unreal since it will damage economic situation in the whole world. 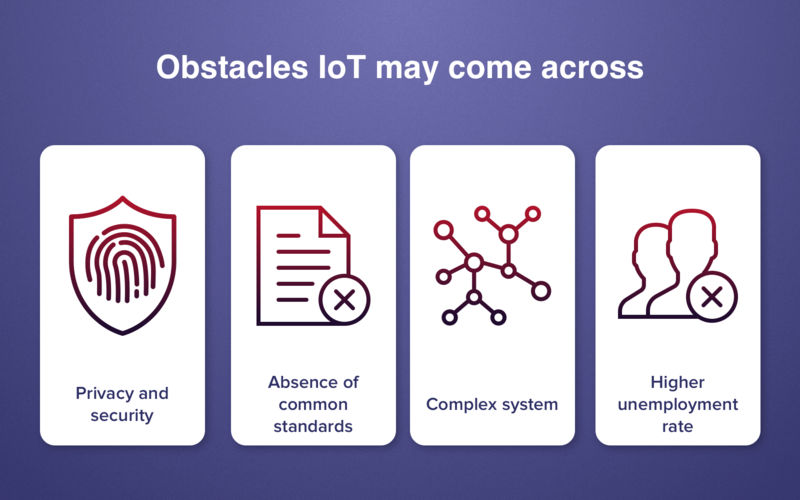 So, the lack of common standards can be the reason for failures in the functionality of IoT devices. As we mentioned above, the longer and bigger system is, the higher the probability of any failures in the system. But considering that this is a financial field, failure in IoT network can become the reason for total malfunctioning in the whole system and lead to huge losses. IoT can be represented as the chain where each link plays an important role in proper connection. Break one link - all chain will be broken as well. And it concerns both hardware and software part. That is why you should choose high-quality hardware manufacturers and experienced software development companies. So IoT in banking industry and other financial services is a technology that is rather difficult to deal with. IoT helps automate working processes that required human brain before, and it means that some employees would simply lose their work positions, especially if these are young and not so skilled workers yet. Banks and other financial institutions will have to cut more jobs with the advent of IoT technologies in the financial industry. Unemployment growth will damage economic and social situation not only in one specific country but also in the whole world economy. Which Top IoT companies lost, kept and won his charm in 2018?